The Linton Music and Beer Festival is now heading for its tenth year. It attracts top international artists, and has gone from strength to strength. With outstanding weather and an amazing line ups both 2008 and 2009 were amazing events! Based on this outstanding success, and with even more bands, do not miss the 2010 event! 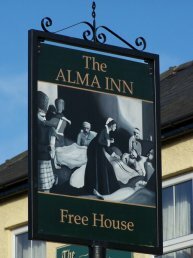 The Alma is a free house serving various real and standard ales and lagers and has been run by Graham and Linda Webb since 1997. The pub has a policy of not doing food, so that more emphasis can be put on creating a social atmosphere. There are no fruit machines or juke-box although there is a pool table and darts board. Currently Butcombe Bitter and RCH Pitchfork are two regular Real Ales on offer with often with two, three and sometimes four other ales as well. The selection of the guest beers is done by way of popular demand and they tend to be drawn from the smaller and relatively local breweries. The Alma was voted "Herefordshire Pub Of The Year" for 2002 and again for 2005 in the CAMRA awards. The dates have been confirmed as 18th, 19th & 20th June 2010. More details on the lineup can be found here. The ticket includes one reusable plastic glass that's issued at the gate for use in the beer tent. If the glass gets damaged then others are available (for a fee). The soft drinks area provides a range of non-alcoholic drinks. There are food stalls available including roast pork and apple baps, burgers, vegetarian selection and ice creams. 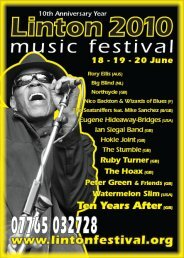 More details and ticket details can be found on the official Linton Festival site.